Facebook is reminding users who access the social network via mobile devices that they have choices when it comes to auto-play videos. You can change your settings so that videos only play automatically when you’re using Wi-Fi. This will help to save your mobile data. 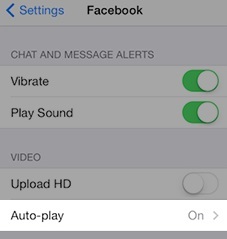 You can adjust your auto-play settings to on, Wi-Fi only or off. If auto-play is on, the data used depends on the amount of time you spend watching a video. If you scroll past an auto-play video in News Feed, your phone will use less data than if you stop to watch it for a longer period of time. 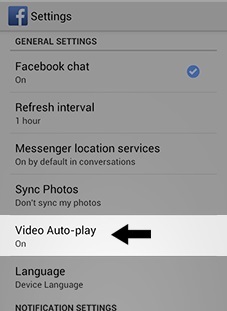 If auto-play is set to Wi-Fi only, no data will be used. Tap (the icon with three parallel bars). Scroll down and tap app settings below help and settings. Go to your phone’s or tablet’s iOS settings. Scroll down and tap Facebook. 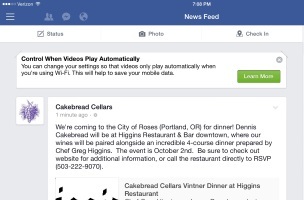 Readers: Have you seen similar messages when accessing Facebook via mobile devices?